The school aims at providing a stimulating experience in a friendly and informal environment through a favorable student-teacher ratio of 1:5. With English as the medium of instruction, the education provided is board-based, giving every child an opportunity for mental, social and emotional development to the fullest. The emphasis throughout is on helping the child to acquire linguistic competence through communication that is best suited to his/her need. The school also aims at finding each child’s area of competence and helps him/her to become a confident, well adjusted person who is able to completely manage the limitations of his/her sensory impairment. 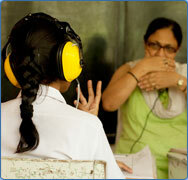 The ultimate aim is to develop the child’s resources of normality, which have not been impaired by deafness. © 2011, The Oral School for Deaf Children. All Rights Reserved.